Sporting an impressive Full HD display, the Gionee M7 promises great multimedia experience and superb power. The mid-range device comes with a robust octa-core processor and abundant memory, amongst other amazing features. At roughly 6 inches, the Gionee M7 is a big phone. You may require shifting up or down to operate with a single hand. But this is an attractive, svelte device. It measures just 7.2 millimetres in thickness. 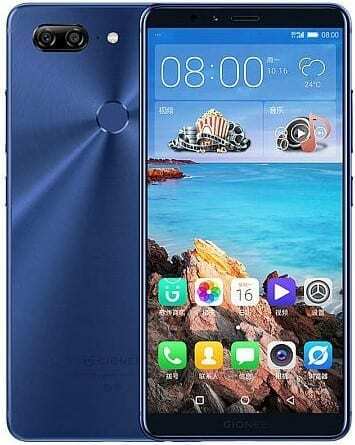 Gionee M7 sports gold, black, blue or red finish. The massive FullView AMOLED display promises enjoyable viewing with an 18:9 aspect ratio. Another thing that suggests great experience awaits on the 6.01-inch screen is the Full HD resolution. This offers roughly 400-ppi pixel density for very sharp images. It has 2.5D curved glass on the surface. Specs sheet shows the Gionee M7 is a dual camera device. It packs a 16MP sensor and an 8MP sensor on the rear. This one is obviously competing, to an extent, with some heavyweights on the market in this regard. As one would at least expect, the phone shoots Full HD (1080p) videos at 30 frames per second. It uses a very capable looking 8MP sensor for selfie taking. You can expect robust performance from the Gionee M7, with an octa-core MediaTek Helio P30 processor under the hood. The Cortex-A53 CPU zips along at speeds up to 2.3 GHz. It comes with a Mali-G71 MP2 GPU for solid, enjoyable gaming. RAM is abundant at 6 GB; the same is true for the onboard storage of 64GB. The phone also takes a microSD card (up to 256 GB) for expansion. Gionee M7 boots Android 7.1 Nougat OS with Amigo 5.0 skin from the factory. The Gionee M7 is one of those devices that promise to last a long time on a charge. It packs in a powerful 4,000mAh Li-Polymer battery. This also enjoys support of fast charge tech for quick top-up. You will find a fingerprint sensor on the rear of the mid-ranger. Gionee M7 also offers you 4G LTE with Voice over LTE (VoLTE) support. Among the connectivity features are USB On-the-Go (OTG), NFC and infrared blaster. Gionee M7 is not yet available in Nigeria and Kenya. Gionee M7 Price in Nigeria is expected to range from 150,500 Naira to 230,000 Naira, depending on your location in the country. Price in Kenya is expected at around 49,500 KSh.